The angel Gabriel brought a message to Mary of Nazareth, an unmarried Galilean peasant girl, asking her to be the mother of the long-awaited Messiah. The story opens with a bold but simple statement. 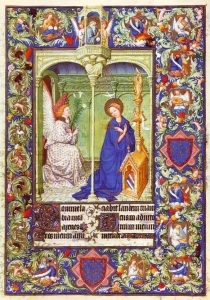 In the sixth month of Elizabeth’s pregnancy, the angel Gabriel came to the small town (not a city as Luke calls it) of Nazareth and visited a young woman who was engaged to marry a man called Joseph; he was of the house of the great King David, and her name was Mary. These two young people were promised to each other, but not yet married. This meant Mary was still living with her parents, in a modest home in a small, backward village. They were obscure, unimportant people, known only to their relatives and friends. Had the angel not approached Mary, or if she had baulked at the angel’s request, no-one would ever have heard of them. Who or what was an ‘angel’? An image probably jumps to mind of a white-clad, winged young man. 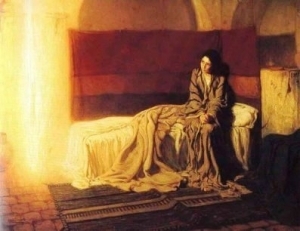 This is the way that angels are traditionally po19th century photograph of a Bedouin girlrtrayed, and we are so used to this that we find it difficult to imagine Mary and the Angel as anything other than two separate figures facing each other in a simply furnished room. But what did the writers of the gospels mean when they used the term ‘angel’? They were speaking of a message from God. It could come in a dream, or as an overpowering premonition, or as a vision. However it appeared, it was powerful enough to shake the person to their foundations: the person who received/saw the Angel/message was convinced they had received a message directly from God – it was, in fact, God-given. This is what Mary experienced. Read the blue text at the end of this page. Mary was initially startled by being addressed as ‘favoured’. This is hardly surprising, since she was at the bottom of the social ladder: a young childless woman from an obscure family and an Annunciation, the angel Gabriel and Mary of Nazareth unfashionable part of the world. The angel’s reply was that she was favoured by God, and that she was to have a son who would be the Messiah. This meant a dazzling future for her. All Jewish people at that time expected the arrival of a Messiah who would give them a glorious future: enemies would be vanquished, poverty and hardship eliminated, people transformed by goodness. Mary’s deep-felt awareness of her son’s future must have been overwhelming for such a young girl – as it would have been for anyone. 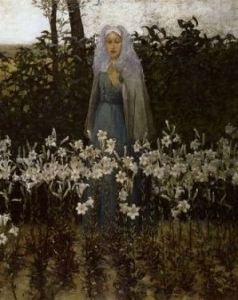 The Annunciation, painting by George Hitchcock Mary does not seem to have doubted for a moment that conception could occur. 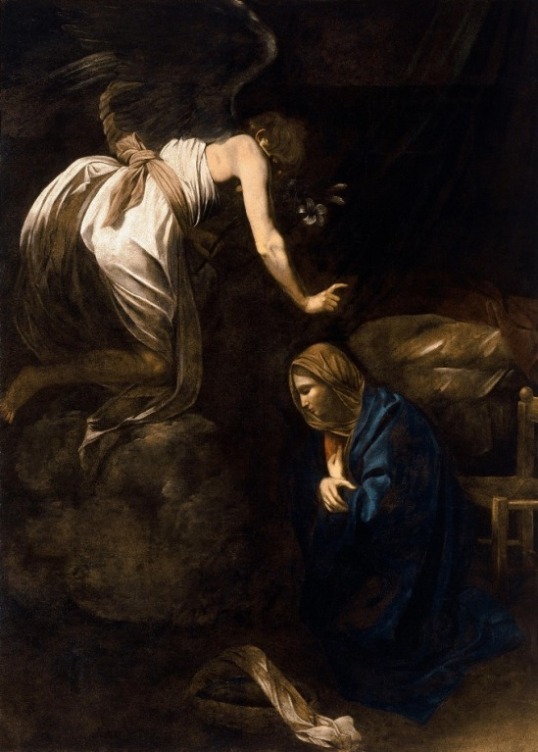 She was perplexed because she knew she was unmarried, but unlike Zechariah when he was told about the conception of John the Baptist, Mary did not ask for a tangible sign. She understood the angel’s words to be referring to an immediate conception, and this puzzled her. 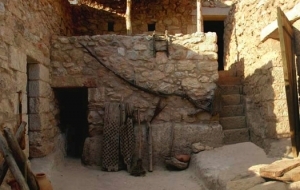 She could not imagine how she could conceive before her marriage, and her marriage to Joseph was still some months away. The angel’s reply made it clear that this was to be an exceptional birth. Mary’s son was not to be an earthly Messiah, born of earthly parents and raised by God to the level of a great hero. This was to be truly the Son of God, and his birth would be due to the power of the Spirit of God coming over Mary so that her child would be divine. He would surpass King David and his heirs, who were only adopted sons of God. The ‘angel’ told here that the sheer creative power of God would result in a child who would not be conceived in the normal way – because this child would have a special purpose quite different to other children. He would be ‘holy’- not just virtuous, but set apart, special, mysterious. Mary’s virginity is stressed in the gospel narrative to underline this breath-taking miracle. Mary quietly accepted the angel’s message, and God’s offer. ‘Let it be’ inverts her first words to the angel, which had been ‘How can it be?’ She had an interior, spiritual experience which she alone knew about; Luke tried to describe this experience as best he could. But in the end, the story is not about what happened to Mary, but about who Jesus is; not about how God created Jesus, but why. Quietly as the angel had come, it left. God’s message had been given and received, and Mary was with child..
Luke 1:26-38 26 In the sixth month the angel Gabriel was sent from God to a city of Galilee named Nazareth, 27 to a virgin betrothed to a man whose name was Joseph, of the house of David; and the virgin’s name was Mary.